The Ashes series for a long time now was a boring one-sided affair. Every year the British used to talk about why their current side are the favourites to win the series that year. But in the end the Aussies used to win the series relatively easily. But this year the likes of Flintoff, Vaughn, Jones and others in the current English team are proving too much for the Aussies to handle. What an exciting series this year’s Ashes has been so far. Today is the first day of the final test. 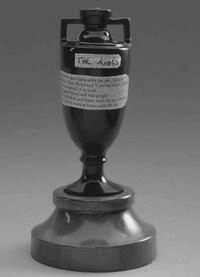 With the Aussies striving hard to deny the English team the Ashes Urn, this test has started with a bang. The momentum has already fluctuated to both the sides. If the first session belong to the England team, the Australians bounced back strongly with quick four wickets by Shane Warne. But Strauss has played a very vital knock with support from Freddie Flintoff. As I write this Strauss(116*) has already completed his century and Flintoff(71*) is fast approaching his century. Just struck a Warne ball for a six. With England score at 269/4 the match is now interestingly poised. The England team have less pressure at the moment. The Aussie skipper Ponting has alreay shown some nerves with his talks about the captaincy. The frontpage in today’s Evening Standard reads “Shamed Warne – Aussie star forced to open his bags as he sets off store alarms”. The best thing from this series is that it has made the youngsters in this country to turn on the tune into Cricket for the first time. I now have a few more friends who talk about Cricket nowadays. It will not be surprising if you look at the recent performances of the English football team.